Spring is Here: Time to Start Seeds! ​Spring is here! Finally, the weather is warming and the soil is thawing. Out here at the village we’re starting to emerge from hibernation and get excited for this year’s gardening and planting. We’re dedicating our workday on Sunday March 15th to starting seeds and we’re inviting anyone who wants to get their hands dirty to come join us! The workday will run from 3 pm until 6 pm. We’ll be starting seeds in planters and getting them watered and settled in the greenhouse and in south facing windows. You’re invited to come for some or all of it, to get your hands dirty or just come hang out and enjoy good company in the village. After the workday we’ll wash off the dirt and have a potluck and celebration of the coming of spring. Bring food and friends and come to enjoy warm air and rich soil! We’re still looking for people to fill some rooms in the village. We’re looking for people interested in sustainable living, organic farming, permaculture, cooperatives and community to join the village and help grow it in to something we can all be proud of. Over the course of the next year or so we’ll be working to buy the house we currently rent, build systems to maintain and grow our 3 year old food forest and build numerous more organic garden beds. Building a swimming pond and or multiple new greenhouses would be a bonus. We have a couple of rooms that will be opening on November 1st, so we’re looking for at least two new members to join the village. All members are required to sign a 6 month lease, attend two workdays and meetings each month on the 1st and 3rd Sunday of the month and pay $50 in dues in addition to rent every month. In return, members gain access to the food forest, gardens, existing greenhouse, and tools. As well as a say in how dues are spent, what to focus on building and how to go about building it. Rents range from $140/month for the smallest room to $250/month for the largest. If you’re interested in community, permaculture and sustainable living, get in touch with us! We have two rooms opening up this fall in Dandemonium house (1710 W. 8th Street). The house sits on a half acre just adjacent to the land and is the primary group house of Dandelion Village. It’s about a 10 minute bike ride down west 7th street to get to down town. The half acre itself is host to multiple gardens and a greenhouse. Back on the land is a three year old food forest, several naturally built structures, an outdoor classroom, a pond and two and a quarter acres of space to grow. We’re looking for people interested in and excited about sustainability, permaculture, and community. There’s a lot to do in the coming months so if you’re excited about helping to build a forming ecovillage, if you want to have a voice in the structuring of a coop, if you want to help design and expand a food forest and organic gardens, then we want to hear from you! There are a few responsibilities that come with all that goodness. We have mandatory meetings and workdays on the first and third Sunday of every month. You’ll be required to attend these. The workdays start at 3 pm run until the meetings at 6 pm. The meetings are usually over by 7:30 pm or so, but sometimes run a little longer. You’ll be responsible for paying dues to the village each month of $50 per person in addition to rent and utilities. We ask for a 6 month lease so that we can maintain some continuity and you’ll be responsible for the rent until a replacement is found if you leave before the term of that lease. And with a voice in the way the community runs and is structured you’ll have the responsibility to use that voice wisely. This is our smallest room. It is the back room on the first floor of Dandemonium house, just behind the kitchen. It’s small, but cozy with a door to the back patio and a built in shelf that can either serve as a lofted twin bed or a storage area. This is the largest room we have. It has a cubby hole, south facing windows and easily enough space for two people. Or one person who needs an office area. Danny Weddle, village founder, and The New Hoosier Broadcasters will be holding a square dance at Dandemonium House (1710 W. 8th Street) this Friday in honor of his moving on from the village. The village has reached the stage where it can survive beyond its founders and Danny has reached the point where he is ready to move on to his next project. And we’re throwing a party to celebrate both occurances! The dance will be start 8pm and likely run until 11pm. If you’re an experienced square dancer come dance with us! If you’ve never been to a square dance, never fear, all dances are taught before hand and easy to pickup on the fly. There will be whiskeys, instruments, dance callers, some chaos, and potentially some raspberries. Come party at the village! 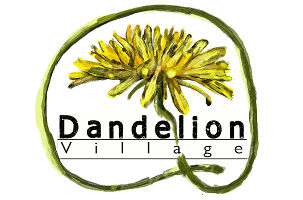 5 years ago I, Daniel Joseph Weddle﻿, was one of the founders of Dandelion Village. Over the years I have always carried a notion that healthy communities can stand without their founders and kept my 30th birthday in mind, as my departure time from the village. Less than 30 days from now I enter that new decade and after taking a couple of short sabbaticals this year have decided to move on from the village to projects of personal inner work and tiny home construction. Fortunately that move is not much of a physical one as I will be landing with the local Catholic Workers as a carpentry intern. 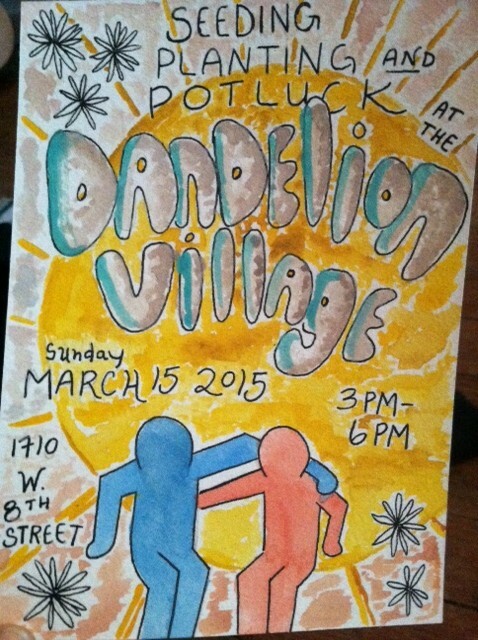 A day of music and fun in the Dandelion Village orchard! The village has been through some changes in the past few months. Among them has been the development of a new website and the shift to a new web server. The changes and development are still on going, so bear with us for a while if things are a little sparse. We’ll get there, we promise.